Mod Podge is crafty sauce from heaven. 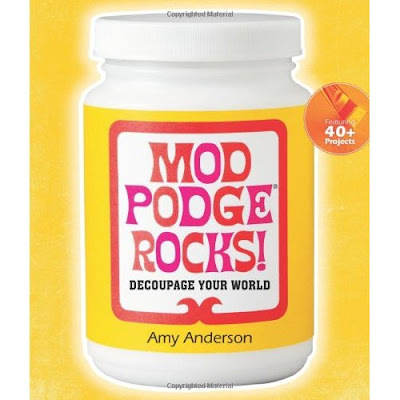 Amy Anderson's new book "Mod Podge Rocks" is full of 40+ projects, which will definitely inspire you to get creative. Mod Podge has come a long way. Or maybe I've been out of the Mod Podge loop. Did you know that, not only are there formulas of Mod Podge in gloss, matte & satin, but there's also hard coat, fabric, tissue, sparkle & outdoor Mod Podge? Know what else?? I'm giving TWO of these books away! Just leave a comment in this blog post (along with your email) & I'll pick a winner this Sunday, June 17th! Disclosure: I received two Mod Podge Rocks! books for this post, to help spread some crafty love. All opinions are my own. Oh my goodness, I want that deer suitcase, too! Meee!!! Really mod podge rocks!! Did you know you can use it as your crackle medium? It's awesome!! I loved mod podging everything when I worked at a summer camp. I mod podged my nalgene water bottle, and I was so sad after my mom put it in the dishwasher and all the pictures melted off! Would love to win! Always looking for new ways to get crafty! no way! my girls would love this! i had no idea there were so many fun things to do with mod podge!!! thanks for sharing, and i would LOVE to win!!! I have been wanting to try the mod podge screen printing method. My jar is getting low :( Time to stock up. Is this an international giveaway? I ask it because I live in Spain, I love your blog and would like to participate. I would LOVE to win this book! I have so many mod podge memories: baskets covered with napkin designs, memory boxes, and so much more! I teach a writing club after school and we could have fun with this with our journals! Oh, how fun! I could use a good infusion of fun ideas! This book looks fabulous! I know, right? I just used modpodge to make photo blocks for a gift...great stuff! would love to get my hands on that book! screen printing and bike helmet projects would the first projects I'd try. Loves me the Mod Podge. It makes a crafty girl's decoupage boxes fabulous. Love the Modge. and the Podge. Love your blog too -- brings a little smile every time I check in! Thank you! Oh "deer" me, that suitcase is gorgeous!! I would love to have more ideas of what to do with my hodge podge! Mod podge is the nectar of the gods for crafters! I hope I win a book to try some cool projects. How fun!! I've never used mod podge Before. I love crafting so I must look up some projects! I would love a book to help me figure out my modge podge...and for my kids to join me! I would really love to win one of these books. I have 5 of the different kinds of Mod Podge and could use some ideas on how to use each of them! I have been experimenting with Mod Podge projects lately and think it is about the most fun thing out there. I love how easy it is to be creative with it. I also love how my sweet hubby sorta giggles whenever I use Mod Podge as a verb (gonna Mod Podge that chair, etc)! I would love to win! I need to try the Outdoor and Sparkly! 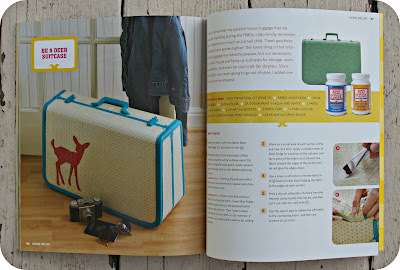 I believe I have already stated that my love of Mod Podge goes back to my childhood! Thank you for the chance to win! I love Mod Podge! Just recently finished a project of making my own photo canvases. Would love to win the book and do more projects! Oh no! I don't think my comment went through.